Shop for Makeup Collections from a variety of different brands. Greener Beauty is always vegan, always cruelty free, only ever ethical brands and always toxic chemical free. 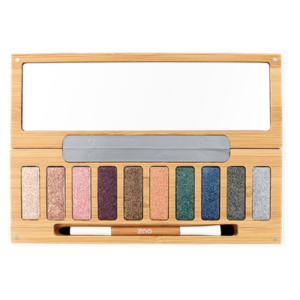 ZAO Eyeshadow Palette 'clin d'oeil' is a beautiful refillable bamboo palette contains 10 ultra-pearly eyeshadows in on-trend metallic shades to suit all skin tones. With intense pigment and a silky texture, the eyeshadow powders contain organic castor oil to moisturise skin, as well as silica to regenerate skin, due to its collagen-promoting properties.